Choose one of the four smileys that intuitively suits your mood and do it several times a day, preferably. 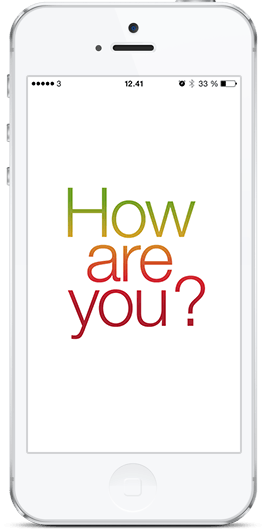 Pulling the everyday activities from your smartphone calendar to the app calendar the How Are You? will compare your smileys directly with the life you are living. How Are You? will illustrate your wellbeing day by day and month by month in simple manageable graphs helping you to get a better survey. Registration of your mood one or more times every day gives you the opportunity of checking your well-being over time and helps you to see when things go wrong, and when things are working optimally for you. Already after a short period with daily smileys you can see how your mood is in consonance with your activities and in this way map down what and who is influencing your well-being in a positive or negative direction. The graphs will give you a visual overview of any trends in your well-being: Do you feel better in the morning or is it the other way round? Do you experience frequent fluctuations, or is it as if there are no fluctuations at all? But most important of all, the graphs will show you clearly when the mood is declining, so that you can detect and take action in a potentially impending crisis before it occurs. Who can use How Are You? How Are You? has been developed for those who want to optimize life. It focusses on your well-being and shows you the relationship between the life you are living and the well-being you experience in your everyday life. The App is an easy and manageable tool for all who want well-being to be the guiding element for your choices in your everyday life. Are you in the middle of a life crisis? Whether you are suffering from stress, depression, anxiety, eating disorders, lack of libido, conflicts in a relationship or something else - the cause can be a lack of awareness of resource balance in your life. Just as the red figures on the bank account show overconsumption, the risk of a crisis in life is increased if you have a continuous overconsumption of your personal resources on your inner account. How are you? can help you to focus on your resouce balance. It makes you stop and consider the situation so that you will get an overview of your well-being or lack thereof. The method behind How Are You? - was developed by Lene Bammeskov Cand.Psych.Aut. SIn her treatment of troubled clients since 2008, Lene Bammeskov has worked on the registration of well-being with smileys and compared the registered well-being with the clients' calendar appointments. The strength of the method is that she creates an overview and insight, and it is in no way time consuming or difficult to understand. All clients, irrespective of age and ethnicity, can use the method, and the nearest relations and other therapists are able to quickly acquire the 'harvested' results. 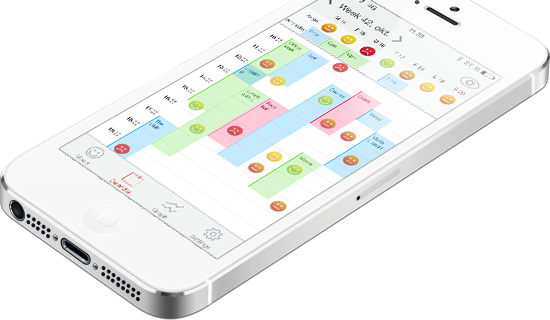 As more and more clients began to use the calendar on their smart phones rather than the paper calendar, the idea of creating an app arose. This can make the method both easier and even more visual. Lene Bammeskov explains: ”It is my experience that we, as modern human beings, must be especially good at feeling, understanding and making active choices. There is an enormous amount of possibilities, offers and demands that combined ideally will be a challenge and offer an exciting life, but which in many cases are overwhelming in the same way as a large breakfast buffet - ’the eyes can often eat more than the stomach’, and only too late do we register that we have forgotten to check on the way. If we suffer from a crisis, it might be that we have to get better at sorting and clearing up on the 'plate' in order to focus on the factors that will strengthen the well-being and increase life quality. The How Are You? app is inspired by cognitive method diary keeping. It is the wish, in compliance with diary keeping, to create an overview of the relationship between well-being and everyday life. Where focus in the cognitive psychology in a simplified manner deals with the individual's thoughts, the How Are You? app has a wider aim. With a starting point in mindfulness and social psychological theory, it is the wish to strengthen the individual's focus on 'checking' and clarifying the importance of the individual's context in the form of: what, who and how much will have to be in your calendar to enable you to experience optimal well-being. The contents and the rights of this app belong exclusively to HOW ARE YOU ApS. All information and all the material, including brand names and logo types, are protected by current legislation on intellectual property rights and must not be used without the written consent of HOW ARE YOU ApS. The contents must only be copied for one's own use. 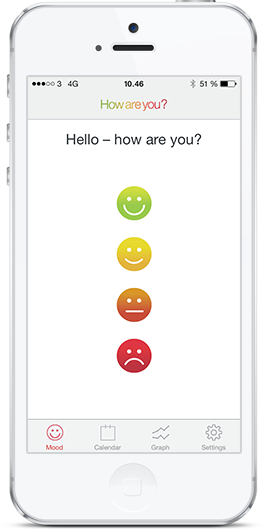 The "How Are You?” application is a tool to optimize well-being and by doing this avoid or get out of a crisis. In this connection it is important to emphasize that the tool is no replacement for therapy - therapeutical or medical. Your well-being and other personal information are registered in the application. This data is only stored on your mobile phone, but be aware that other users of the mobile may get access to this information. The use of the How Are You? application is your own responsibility. 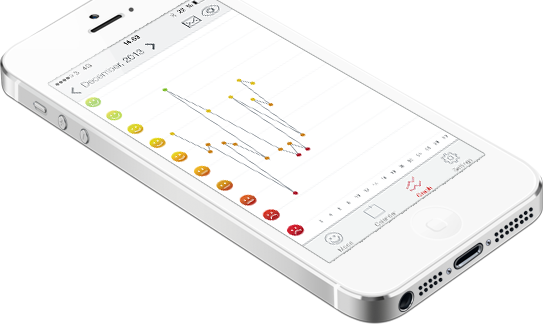 This application (“Application”) helps people track their general well-being. The information provided in the Application is for general information and registration only. It is not intended as medical healthcare counselling or to be used for medical diagnosis or treatment for any individual problem. It is also not intended as a substitute for professional advice and services from a qualified healthcare provider. Always seek the advice and counsel of a qualified healthcare provider regarding your individual medical condition and needs. The Application provided by the company How Are You ApS (“How Are You?”) is provided as is, without warranty of any kind. How Are You? expressly disclaims any warranty regarding the Application including any implied warranty of merchantability, fitness for a particular purpose or for failure of performance. How Are You? does not warrant that the Application will be free from defects or errors. You agree that the download and use of the Application is at your own risk and responsibility. How Are You? is not responsible for any damage or losses whatsoever resulting from your download or use of, or your reliance upon the Application. By downloading the Application you expressly agree to hold How Are You? without liability for any loss, harm, injury, or damage whatsoever resulting from or arising out of your use of the Application. You may use the Application only for your own personal, non-commercial use. You are strictly prohibited from, and agree that you will not engage in adapting, editing, changing, modifying, transforming, publishing, republishing, distributing or redistributing this Application or the material in this Application (in any form or media) without How Are You?’s prior written consent. You further agree not to use any automated data collection methods, data mining, robots or scraping or any data gathering methods of any kind on this Application. All intellectual property in this Application, including all Application material, is protected by copyright, trademark, or patent laws, and is owned exclusively by How Are You?. Intellectual property includes, but is not limited to, software code, scripts, design, elements, graphics, interactive features, artwork, text communication, and other content that may be found in the Application. All trademarks, service marks and trade names are owned, registered and/or licensed by How Are You?.